The Sunderbans are located in a river delta in the Bay of Bengal. Two major streams of South Asia – Brahmaputra and Ganges – mouth to the sea here. 102 islands are situated in this world’s largest river delta. Approximately 60 per cent of the Sunderbans belong to Bangladesh, the former East Bengal, 40 per cent to India’s state of West Bengal. 21°30' to 22°15' North; 88°10' to 89°10' East. The Sunderbans are the largest mangrove forest worldwide; they cover 60 per cent of India’s total mangrove area. Roughly 90 per cent of all Indian mangrove species are found here. The mangroves play an important role as a buffer zone as they protect the fauna, the island and the alluvial soils from rises in sea level, torrential rain and cyclones. The Sunderbans are home to a huge variety of species, out of which the Royal Bengal Tiger (panthera tigris) can be named as the most significant flagship species. Only in the Sunderbans it shows distinct amphibian behavioral patterns. The tigers roam the entire area, sometimes crossing several kilometres swimming. 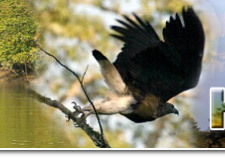 Moreover the Sunderbans are home to many amphibiae, reptiliae, fish and mammals as well as more than 180 bird species. The average temperature is from 8.2 degree Celsius to 34.7 degree celsius. The annual rainfall is 1500 to 2500 mm, the relative humidity between 62 and 88 per cent. The wind speed is from 1 to 6 km/h, but during cyclones sometimes speed up to 160 km/h is measured. Per year 4 to 8 cyclones afflict the area. The Sunderbans are a wilderness encroached by men. On the bigger rivers transportation by ship is possible, into the smaller creeks only country boats can enter. 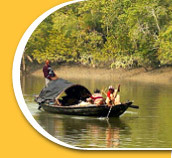 The major means of transportation are water based in the Sunderbans. Anything, that is not available locally has to be brought in by boat. Accordingly the shores are well connected by this traffic and many settlements are located there. The hinterland is connected with the shore by a network of paths. Step by step the muddy paths are being paved, some as well asphalted. Cars are very rare, on some major routes motorized rikshaw taxis communicate. Bicycles are facilitating personal traffic whenever the quality of the paths allows using them. Bicycles, fuel, bricks…almost everything had to be brought in by boat. Most of the people in the Sunderbans are fishermen or farmers. Houses are built with locally available materials: timber, mud, paddy straw. Often the houses are surrounded by paddy fields, in which families grow paddy and – in a small scale – vegetables. Agriculture in the Sunderbans is dependend on the rainfalls during the rainy season. They are sufficient for growing paddy, but normally allow only one yield. The Sunderbans are a rich fishing ground. Yet the fishermen’s life is not easy. The fishing nets are still often knotted by hand, the weirs plaited manually. Fishing is still handwork, yet over fishing increasingly becomes a challenge. The protected areas in the Nationalpark are important breeding grounds and are strictly protected by the park rangers accordingly. Collecting the rare mangrove honey today is allowed only during special times and in selected areas. The market days are a big and important event. Farmers and fishermen sell their products and purchase what they cannot produce themselves. Tradespeople from other areas offer all kinds of curios. People come from near and far and thus the market days are an important platform for communication and information. Saturday morning is busy-ness time. TV-antennae are a rare sight and radios are hardly heard. Electricity mostly derives from diesel generators, increasingly by solar power as well. It will take some time, until street lamps light at least the major paths. So long people stay dependend on battery pocket lamps, if they do not want to roam in complete darkness. For example, when the market visit took longer than expected. Or when it got late with the card play. Again and again men in the Sunderbans are attacked by wild animals – sharks, crocodiles, or tigers. Especially when fishermen or honey collecters enter the dense mangrove forests they are exposed to danger. The fencing around the protected area made by the national park administration protects in double regard: the tigers from men (poaching has become very rare), and the men from straying tigers. When men entered the forests in earlier times, they wore a mask on the back of their heads. It is said that the tiger never attacks from the front. Bonobibi, the Goddess of Forests, is widely worshiped. Before fishermen go out it is obligatory that they ask the Deity for support and safety. For the big festival Bonobibi Puja, celebrated once a year, artists form splendid idols using paddy straw and mud. The Sunderbans Jungle Camp lies next to a small agricultural settlement, embedded between river and paddy fields. The construction follows traditional patterns and local materials were widely used. The camp consists of six bungalows which are grouped around an amply fishing pont. All bungalows offer a sleeping area with convenient king size beds and a shower bath with western style toilet attached. The sun is heating the water to pleasant temperature, electricity for lighting is generated by solar panels and the fans are operated by generator-energy on demand. The dining area, situated next to the pont, is kept open. On the “Fishermen’s Deck”, one can sit on a terrasse above the pont. A bamboo bridge connects the bungalows on the other side of the pont with the dining area. Moreover the ground hosts the office of the local Nature and Wildlife Protection Society, where detailed information about the “Ecosystem Sunderbans” is provided. The staff of the Sunderbans Jungle Camp are local people, living in the immediate surroundings of the camp. With their honest hospitality they try to read every wish from the visitor’s eye. Though the guests’ behavioral patterns sometimes differs from the local habits, the staff is keen to learn and understand. People coming from outside the Sunderbans are an important link to the “outer world”. Many things that are taken for granted in industrialized states is rarely available – though not unknown – in the Sunderbans. Guests, who are not afraid of facing enquiring gazes, who explain, communicate and share, will be positively remembered in the Sunderbans. The Bengali Cuisine, as served in the Camp, is hard to find in the big cities. For many Bengali visitors the food is one reason for frequently visiting – it tastes like at home. Whenever possible fresh regional ingredients are used. Mostly a meal is based on rice or chapati-breads, combined with different vegetables, fish, or meat. The Sunderbans are a paradise for those loving Seafood – fish, crab, and prawn. The camp offers a livelihood for many people who otherwise would depend exclusively on agriculture. Besides the ones directly engaged in the camp, many benefit temporarely: craftsmen for construction and maintenance, guides, shopkeepers, or fishermen, who row the guests through the creeks or sell their catch to the camp. Tourism can only be developed with – not against – the local people. Thus right from the initiation of the camp benefits origining from the engagement in tourism were demonstrated to the local people. With revenues from the camp many social projects are funded. The most prominent will be the medical camps, held fornightly in alternating places of the island: consultation offered by a trained allopathic doctor and free medical treatment, if necessary. More than 10 000 people have been treated so far, people for which the next hospital would have been to far. 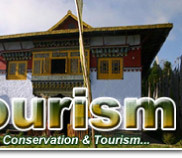 If you would like to learn more about Help Tourism’s social projects in the Sunderbans, please visit our partner organisation’s website www.actnowornever.org. 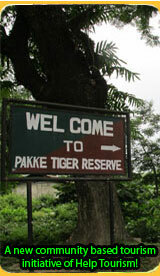 Click for Photos of Sundarbans National Park & Jungle Camp.